Increase in pain due to strenuous activity or physical exercise. As RSD attorneys who are involved in RSD lawsuits we have often seen our clients being delayed in obtaining a correct diagnosis for months sometimes years. Often, our clients have gone from one doctor to another trying to find an answer to their pain. The problem is that doctors do not have an objective diagnostic test for RSD. Many of them go on the history and the physical examination. Even though RSD or CRPS symptoms are constant to a patient the doctors still order more tests which do not always confirm the patients’ complaints. For example, we have had clients who have documented RSD but the X-rays or the MRIs or bone scans do not conclusively conclude an RSD diagnosis. We have seen doctors perform on RSD patients tests including imaging tests, bone scans, infrared thermal imaging, sweat testing, sympathetic nerve blocks, etc. Since there is no cure for RSD or CRPS (Complex Regional Pain Syndrome) treatment is aimed at minimizing the constant pain through prescription drugs, sympathetic nerve blocks,psychological counseling, physical therapy, electric nerve stimulation and acupuncture. Most of our clients are unable to return to their pre-RSD routine which includes family and work life. It interferes with all their daily living activities. We work actively with the Reflex Sympathetic Dystrophy Syndrome Association (RSDSA) and have sent them findings of our RSD clients to assist in studies on how patients can go back to a normal life and resume their prior activities. The CONSTANT PAIN is described as burning pain as if a red hot poker were inserted into the affected area, also throbbing, aching stabbing, sharp, tingling, and/or crushing in the affected area (this is not always the site of the trauma). The affected area is usually hot or cold to the touch. The pain will be more severe than expected for the type of injury sustained. Allodynia is usually present as well (extreme sensitivity to touch). Something as simple as a slight touch, clothing, sheets, even a breeze across the skin on the affected area can cause an extreme amount of pain to the patient. Pain can also be increased by sounds and vibrations, especially sharp sudden sounds and deep vibrations. This makes it especially difficult on the spouses, children, and other family members also; as their softest touch can now cause pain instead of pleasure. If the patient has not been properly diagnosed yet and these sensations properly explained, these symptoms can cause extreme duress and confusion to all involved. The INFLAMMATION is not always present. It takes various forms, the skin may appear mottled, become easily bruised, have a shiny, dry, red, and tight look to it. An increase in sweating usually occurs as well. The SPASMS result in a feeling of coldness in the affected extremity as well as body fatigue, skin rashes, low-grade fever, swelling (edema), sores, dystonia, and tremors. The spasms can be confined to one area or be rolling in nature; moving up and down the leg, arm, or back. The fourth part of this square is INSOMNIA and EMOTIONAL DISTURBANCE. RSD affects the limbic system of the brain. This causes many problems that might not initially be linked to a disease like RSD. Chief among them are Depression, Insomnia and short-term memory problems. RSD causes insomnia by not allowing the body to drift into REM, or rapid eye movement, sleep. This is the sleep that allows the body to use its own healing abilities. Without it, the patients pain cycle continues and becomes more entrenched. As the body cannot heal itself, it becomes harder to achieve that sleep which makes the pain worse and so the cycle continues. Many patients can feel they are losing their mind as their ability to remember things, short-term, greatly decreases. Things like, what someone told you an hour ago, what you had for lunch yesterday, whether you took your pills this morning, what you were just talking about etc. You are NOT losing your mind. Loss of short-term memory is part of RSD. Another sign of problems here includes the inability to think of , um, well, ah, hmm, just the right word. The patient’s ability to concentrate is also lessened while their level of irritability is increased. These problems get even worse as the sleep cycle continues. Movement Disorders – difficulty in beginning movement of the injured part or moving it in general. Color/Skin Changes – Skin may turn shiny, red, dry and tightened; increased sweating, temperature. Nails/Hair – On affected extremity they may grow at an increased rate, nails become grooved brittle. Bone Changes – Softening of the bones, Osteoarthritis, Osteoporosis, joint stiffness/tenderness. Sleep Patterns – Insomnia is often seen, also disrupted sleep pattern. Some Medications help this. Miscellaneous – Dizziness, Tinnitus, Agitation, Irritability, Visual disturbances such as blurriness, dry eyes and others. Also, sounds/vibrations even strong winds can exacerbate the pain as well. 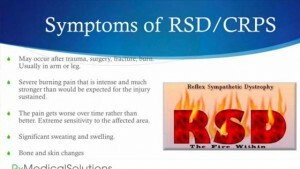 We take RSD cases because we have a thorough understanding of the science of CRPS or RSD and how to present it to the jury, judge and to the defense lawyers. We are experts in presenting constant pain, even though pain is subjective. We use friends, co-workers and family to chronicle our client’s life before the injury and after. We have detailed charts and explanations concerning the diagnosis and treatment of RSD and as an aid to explain it to the jury. If you or a loved one suffered from RSD whether in California or nationwide, please contact us at 1-800-718-4658 to speak to a specialists. You may also complete the confidential no cost email inquiry on the right. We have someone available to speak with you 24/7.